Forests are key in stabilizing the earth’s climate – they hold nearly half of carbon on the land and offset one-third of human carbon emissions. While trees cover 4 billion hectares of the Earth’s surface, we are limited in our ability to preserve and manage them over the next century, simply because these plants remain incredibly difficult to measure in detail without cutting down. In our recent study titled “Assessing terrestrial laser scanning for developing non-destructive biomass allometry,” published in the journal Forest Ecology and Management, we present a new, non-destructive method of measuring forests in striking detail that will improve global estimates of carbon stored in forests. 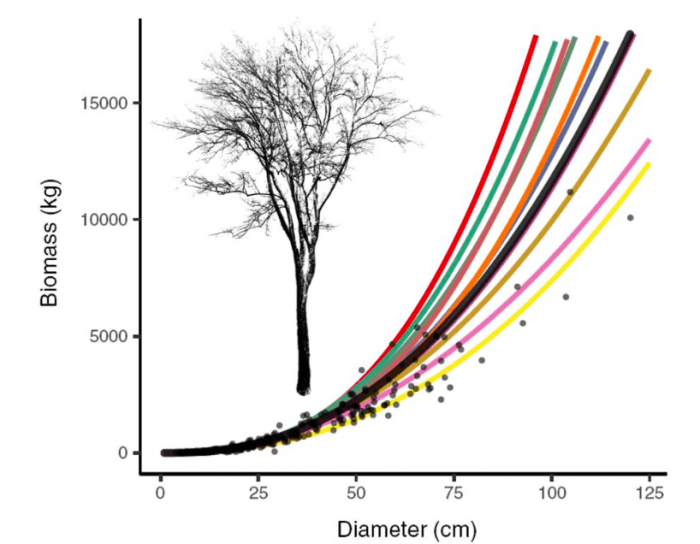 Tree weight is directly proportional to the amount of carbon it holds – approximately one half of a tree’s dry mass, or biomass, is carbon – so accurate tree weight is critical for estimating forest carbon. Essentially, the most straightforward way of measuring how much carbon a tree holds is to put it on a scale. The problem is, weighing trees is expensive, complicated, and counterproductive. Millions of dollars are invested in cutting down and weighing mere tens to hundreds of trees, so it is critical to make the most of the few measurements available and avoid cutting trees, as much as possible. The standard approach of estimating tree weight (and carbon) without cutting them down is to develop a simple relationship between the diameter of the trunk of a tree and the carbon in that tree. Over a range of tree sizes, a relationship begins to emerge – larger trees have more carbon – and we apply these allometric relationships or allometry to millions of tree diameter measurements globally. But what happens if tree allometry breaks down and is not representative of the actual carbon held in trees? Allometry can be unrepresentative for several reasons, but the main issue comes down to not having enough measurements for the largest trees. We must preserve forests, especially those with large trees, but this means foregoing any estimates of carbon for the largest most important trees on the planet. Without an assessment of carbon held in the largest trees, we cannot accurately determine the carbon stored in the oldest and tallest forests on Earth. These issues could be solved with a method of efficiently estimating the weight of trees without the need to cut another tree down. A new technology may be the key: terrestrial laser scanning. Terrestrial laser scanners are instruments that illuminate the forest with millions of laser pulses, allowing millimeter-level detailed reconstructions of the branching architecture of complex forest environments. Imagine a three-dimensional forest that you can walk through and explore in stunning detail. We create 3D models of trees to estimate tree volume and, with wood density, retrieve tree weight. We now have the ability to accurately weight trees with lasers and improve existing assessments of global forest carbon. Forest carbon estimates may be wrong. Why and what can be done? We used this new method to ask two main questions: is current tree allometry accurate and, if not, how can we improve it with terrestrial laser scanning? 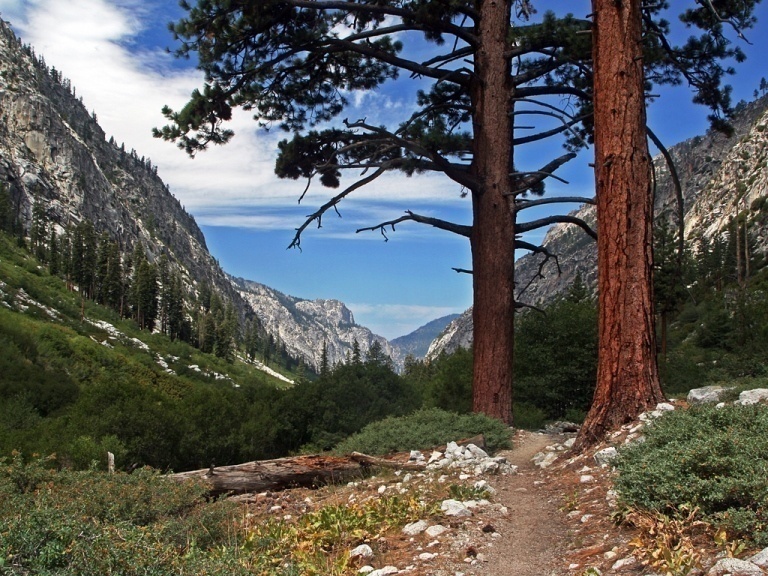 Forests in the US may have significantly more carbon than previously thought. Our new method found 25% more carbon in trees than the traditional approach. The good news is that we have an even greater incentive to preserve forests for combating climate change. On the flip-side, our findings also suggest deforestation may be emitting far more carbon than we previously understood. Essentially, the carbon gained and lost in a forest is much greater than we expected. We also needed to know what makes a high-quality allometric relationship for the most accurate forest carbon assessment. In short, we found a clear need for many more weights across every tree size possible to have unbiased allometry. What happens when we lack enough tree samples or do not include large trees? Carbon estimates become biased, often underestimating. We now know the bare minimum requirements for creating the ideal allometry and why existing equations are biased. But why stop there? With this new method of measuring trees, we can easily collect thousands of samples, ultimately giving us the best possible allometry for accurate estimates of forest carbon. This research is directly linked to NASA’s GEDI (Global Ecosystem Dynamics Investigation) mission (scheduled for launch November 2018) that will measure the Earth’s forests with billions of laser pulses. By combining these cutting-edge terrestrial laser scanning approaches on the ground with GEDI’s measurements of forest structure from space, we will create the most detailed and accurate map of global forest carbon. We detail expected outcomes from our work in a recent study titled “Improved Biomass Calibration and Validation With Terrestrial LiDAR: Implications for Future LiDAR and SAR Missions”, in the journal IEEE JSTARS. These findings are described in the article entitled Assessing terrestrial laser scanning for developing non-destructive biomass allometry, recently published in the journal Forest Ecology and Management. This work was conducted by Atticus E.L. Stovall from the University of Virginia and the Smithsonian Conservation Biology Institute, Kristina J. Anderson-Teixeira from the Smithsonian Conservation Biology Institute and the Smithsonian Tropical Research Institute, and Herman H. Shugart from the University of Virginia.